Interview: Shinya Tsukamoto (Japan) reflects on his film Fires in the Plain – Hello Asia! 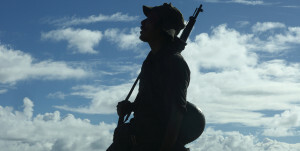 After the Japanese release of 2014 film Fires in the Plain, its multi-talented actor, director and script-writer Shinya Tsukomoto further cemented his status as a visionary creator, garnering a robust cult following. Mr. Tsukomoto is a guest at this years Japanese Film Festival. On Saturday he sat down with Hello Asia!’s Anastasia Giggins to talk about his original inspiration, his creative process, and his award winning film Fires in the Plain. Good afternoon and welcome to Melbourne, Mr. Shinya Tsukamoto! You’ve been making films since you were a teenager. What drew you to this medium, and what is it that continues to inspire you to make films? I started using 8mm films in the beginning. At that time, my father had bought it for himself, and I was watching it and thought that it looked like a lot of fun and that I could perhaps do something with it as well. When you do something for the very first time there is this freshness, this excitement; this was what led me to make films in the first place. And now, every time I make a new film, I feel this excitement as if it was the very first time again. You have drawn quite the cult following, through your films including Bullet Ballet, Tokyo Fist, and Vital. Indeed, as a creator, director, and an actor, you have quite a substantial list of films and TV shows under your belt. What has been your most rewarding project so far? What I find really rewarding is, in the beginning, I find my situation or position really quite vague. As I make the film I actually confirm or challenge what is going on, the themes, and so on. Towards the end I might not actually have a specific answer in regards to what I was seeking but through that process, I actually get to check what I was asking. As well as being a director, you’re also an actor. What are the major differences between preparing for a film that you have to direct, versus preparing for an acting role? When I am actually acting in someone else’s movie, I am really delighted to be part of the film. For the movies that I have been invited to, usually only the directors that really like me would invite me. When I get to be part of that, it is like I am a part of a machine or a car. I become a component of these wonderful films. When I am directing and acting within my own film, I don’t actually see distinct roles. Of course, there will be things like the script or the lighting; these roles have their own jobs, but I don’t actually like to distinguish between them. Not too much, anyway. They are all crucial parts of the process. In your movie Fires in the Plain, you not only directed it, but you also wrote the screenplay, edited it, and starred in it! In fact, you seem to take the same approach to all your films. Could you talk us through this process? My normal process stems from a vague concept that I would like to crystallise or study. From there, it starts to become its actual form. With this movie, the story originates from a classic Japanese book. Here, it was not like it was a vague concept that became more solidified into a form. It was through this that I did more filming and directing, and of course my staff were involved. I would’ve actually liked to invite other actors that I really respect to be in my film, but we had financial restraints. I really think that this movie was made possible by an almost abnormal concentration of powers and help from different people. For the 2015 Japanese Film Festival, your film Fires in the Plain is one of the headlining pictures. Dealing with some very intense, strong, and dark themes of desperation, death and war, your film very strongly conveys the message of the inherently destructive nature of war. Is this something you tried to emphasise throughout the story? When you read the original book, it gives you quite a clear display of what the visuals would be. About ten years ago, I interviewed some soldiers who had been involved with the Philippines and who had participated in the war. I do know that some other films and books they portray death as some sort of beautiful concept but when I interviewed these soldiers, it was clear that there was nothing beautiful about it. It was only that these young people who had a future, they just become cruelly destroyed and rendered into nothing. I do agree, this film does lead you to these themes of death and destruction. With that in mind I was curious, what do you think the main message of the film is? What would you like the audience to learn from? I didn’t have any intention of making this with a political agenda or philosophical schema. I would like for people who watch the film to be free to think about the film. This film is based upon things that actually happened, so I would like for people to think about what we should do for the future. I would like for this film to be a discussion point. This film has been shown at film festivals across the globe. What has been the reaction from viewers of this film? Do you find that this section changes from festival to festival, country to country? Why is this? Last year at Venice Film Festival, usually the audience gives you quite a warm welcome. I received a standing ovation. However, when we look at the mass media, it was quite divided. Some thought that it had too much violence, that it was too gruesome. However, others though that war is violent; war is gruesome, and that it was masterpiece, through its depiction and representation of that terror and destruction. Generally speaking, my films are shown and promoted more overseas and then it comes back to Japan. But this time, I had more of a reaction within Japan. I feel that this could be because at the moment the Japanese government has to review its laws in regard to the war. There are quite a few people, regardless of age, that are quite interested in the war. I was actually quite happy that quite a few people in Japan had come to see the film with great interest. What can fans of your work look forward to next? I have lots ideas in my head, but before I actually decide what to do I actually think that because many people are interested in this work, I actually want the audience to look at my film and appreciate it until the end. After that is done, I will decide on what to do next. Thank you for your time, Mr. Tsukomoto.